What Hawaii Schools are the Most Focused in Agricultural Production? University of Hawaii Maui College is a great option for students pursuing an Agricultural Production degree. Based in Kahului, Hawaii, this college is a good choice for students who thrive in a city atmosphere. About 52.0% of undergraduates get some form of financial aid at University of Hawaii Maui College. You'll get to learn about many different ethnicities thanks to University of Hawaii Maui College's diverse student body. 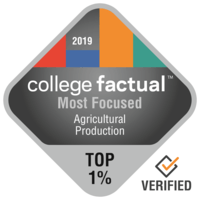 Go deeper and discover just how University of Hawaii Maui College ranks in other categories.